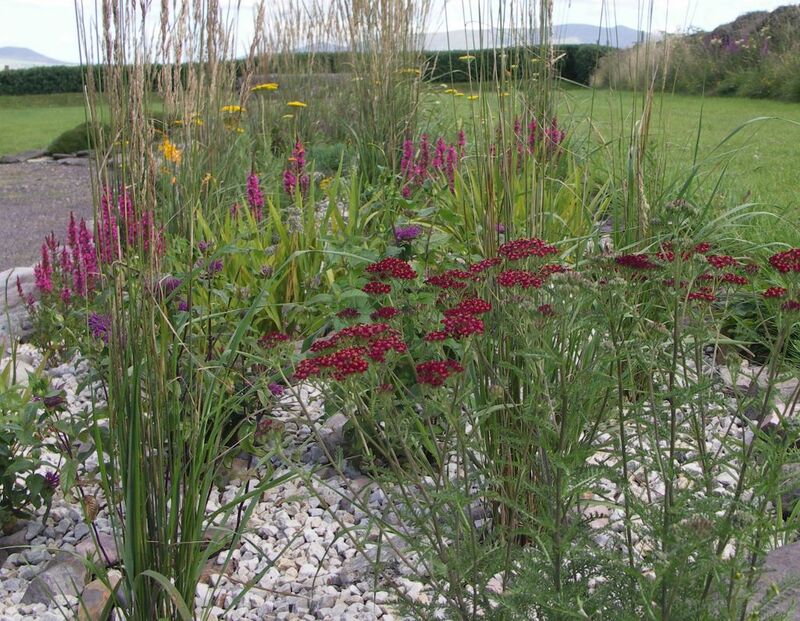 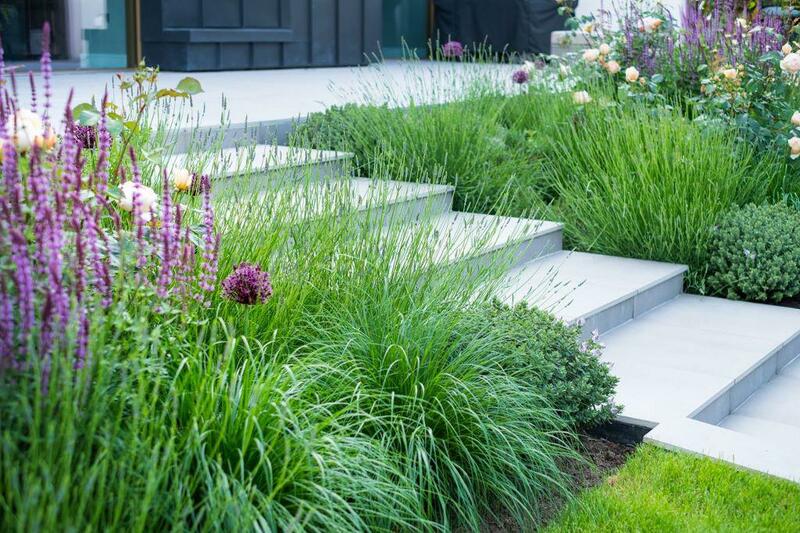 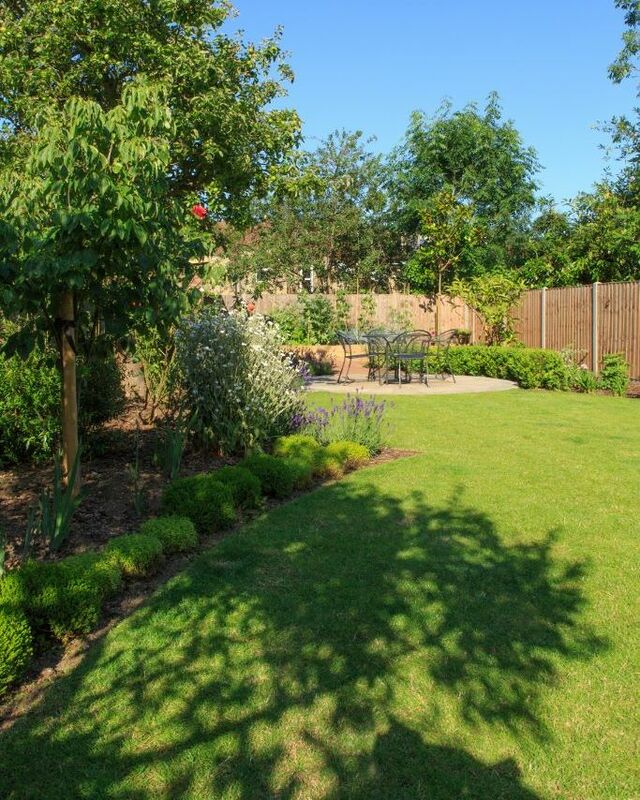 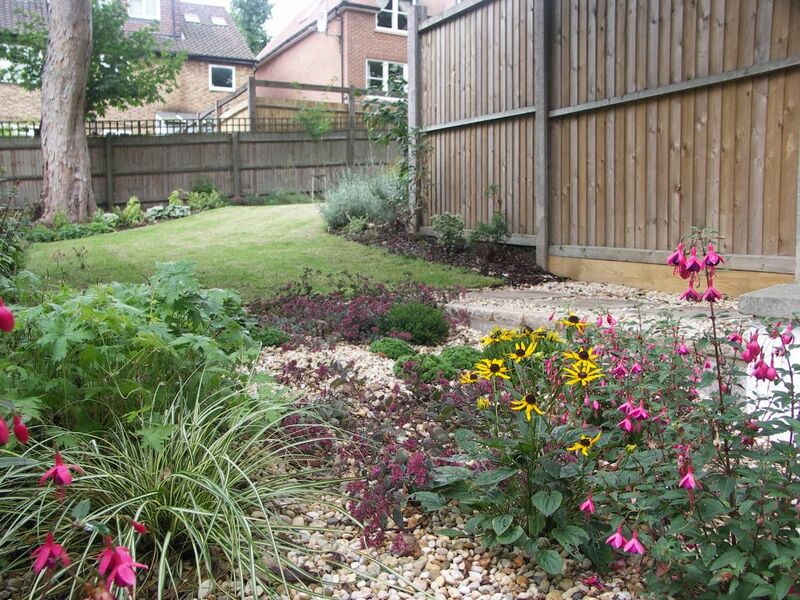 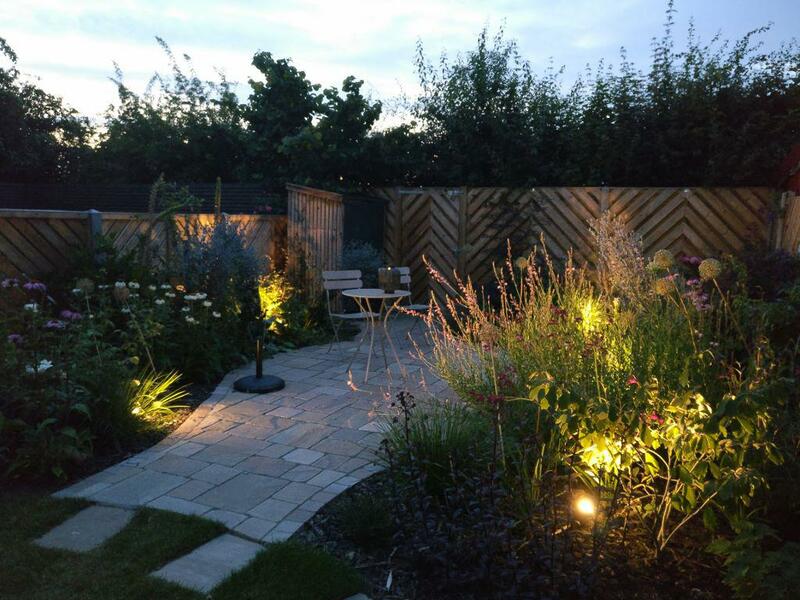 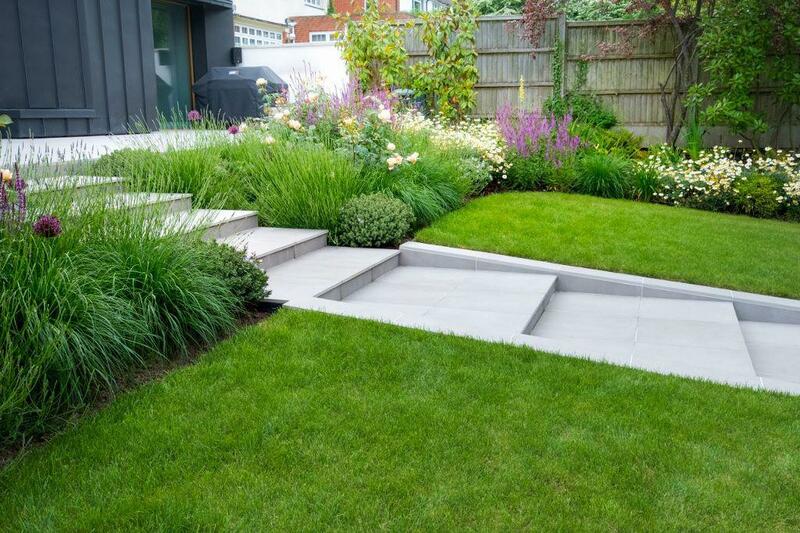 A selection of our garden, planting and landscape designs is shown in our Garden Design Portfolio here. 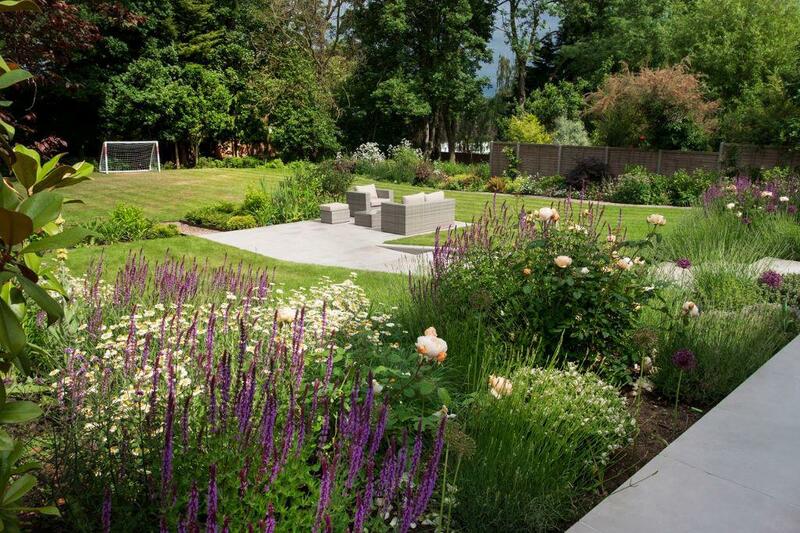 Leaf & Acre’s Garden Design Portfolio contains examples of various styles of garden for different situations. 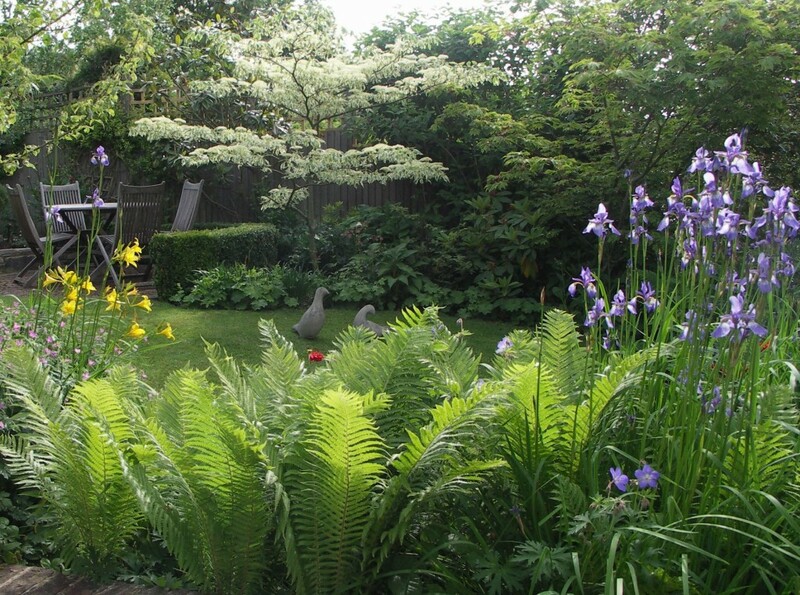 Please scroll down to view each with their picture galleries. 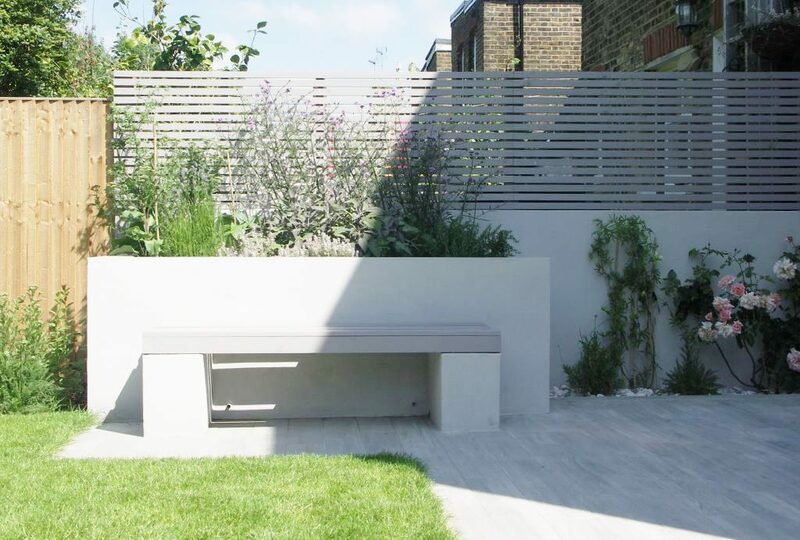 Beautiful pale grey external porcelain tiles are used for this large terrace in Whetstone. 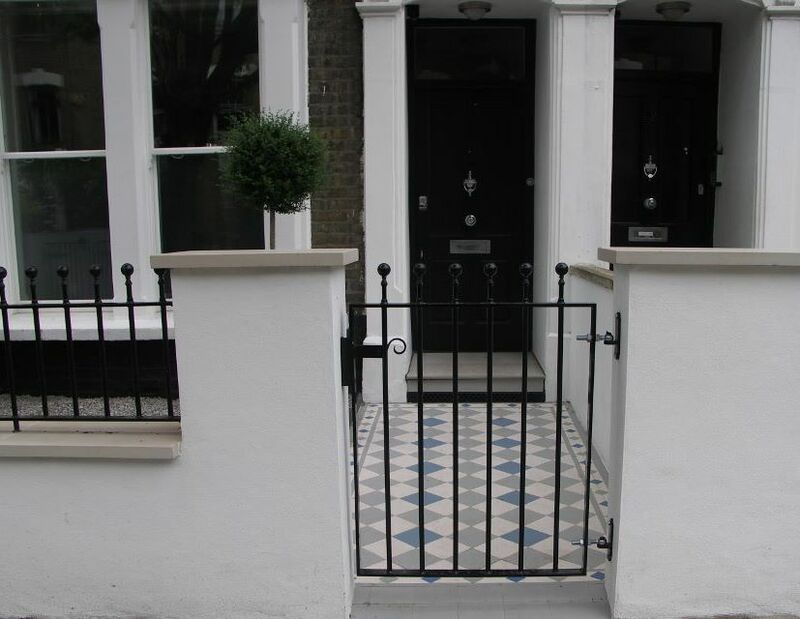 They match the internal tiles and have also been used on 4 sets of external steps and the lower patio. 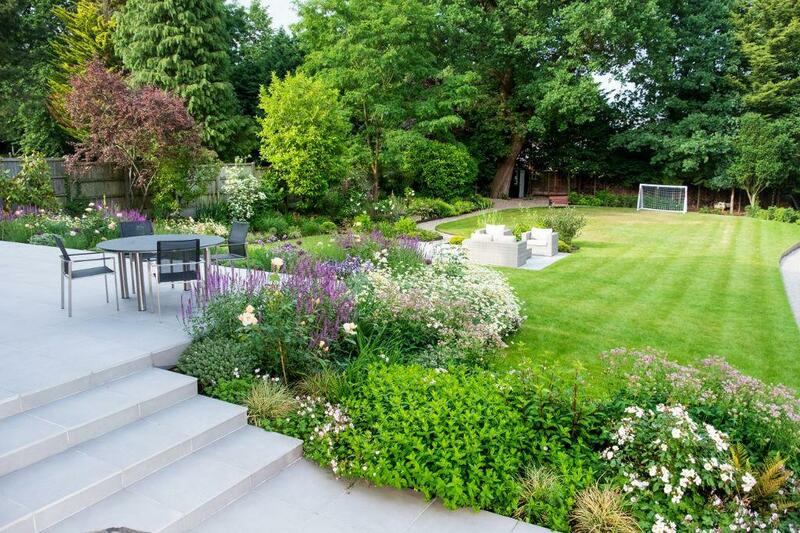 The main steps from the terrace are sunken into the gently sloping lawn. 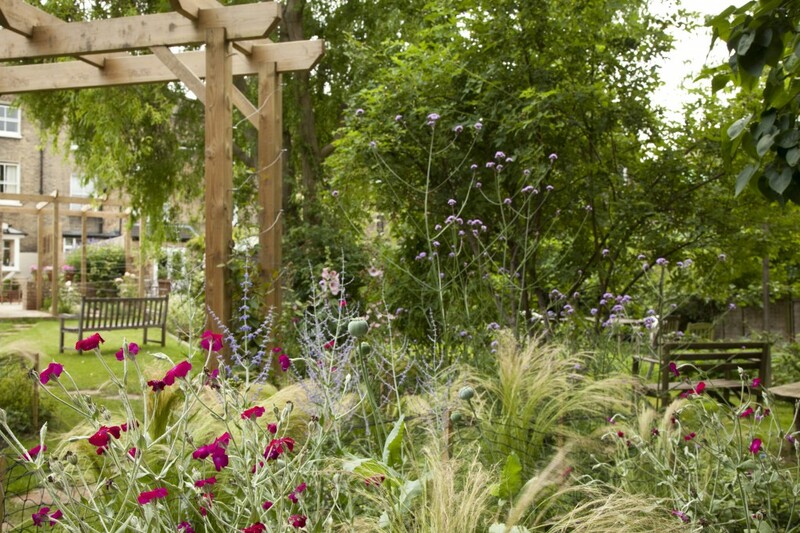 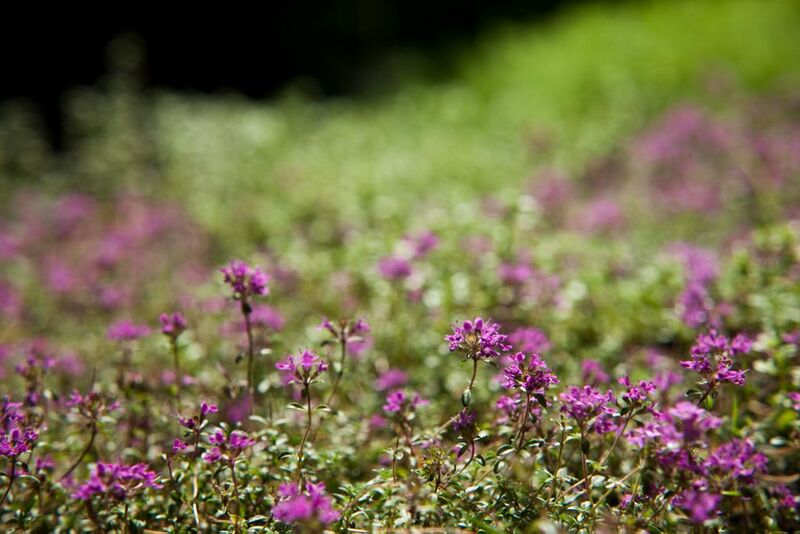 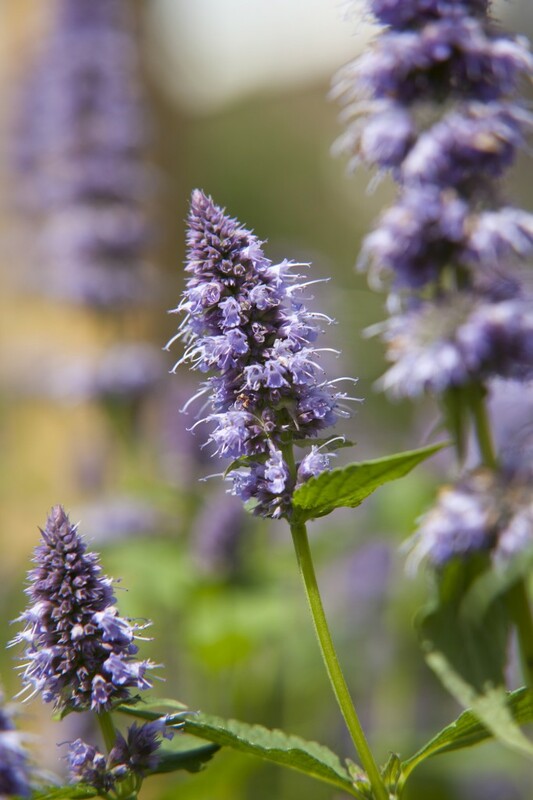 The main terrace borders are banked and planted with sun-loving lavenders, salvias, herbs and grasses. 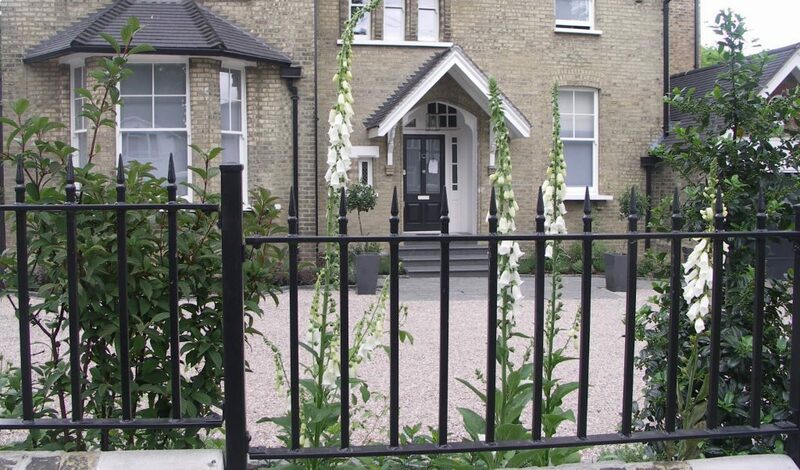 These front gardens include a tiny Victorian garden in Stroud Green, a large Victorian garden in Whetstone, a sunny hillside garden in North Finchley and a colourful garden in Hampstead Garden Suburb. 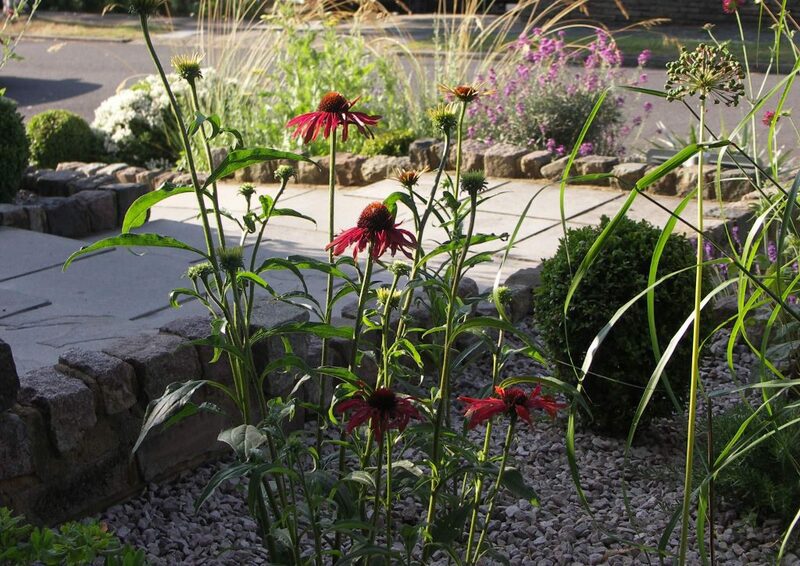 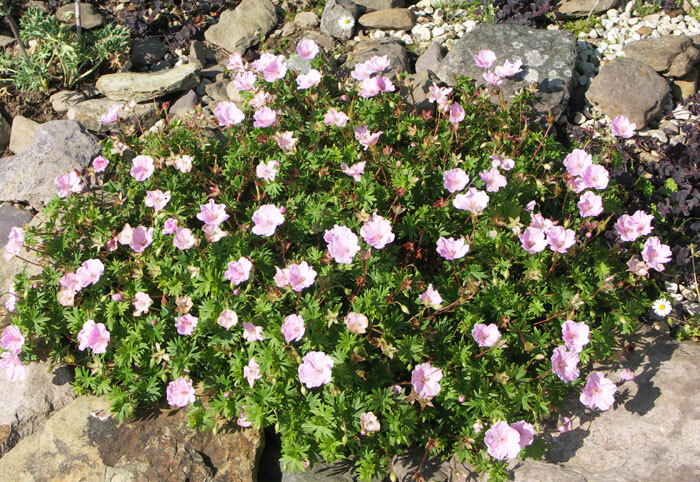 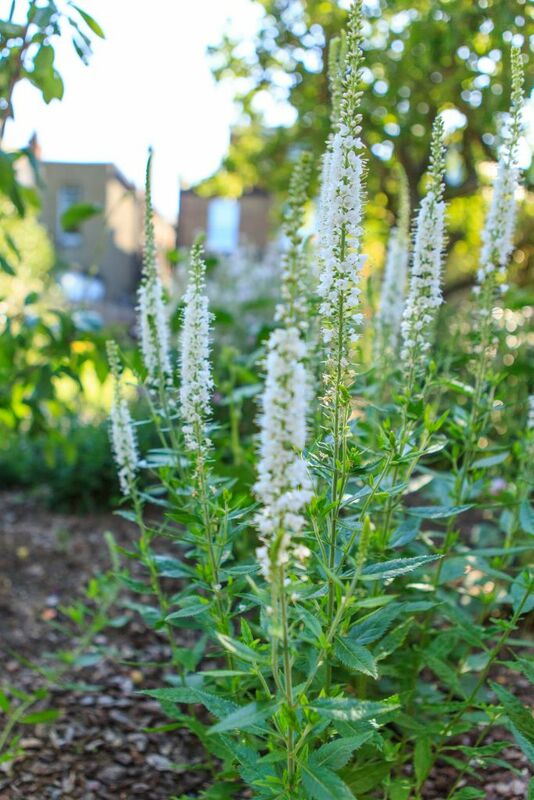 Beautiful plants provide interest all year. 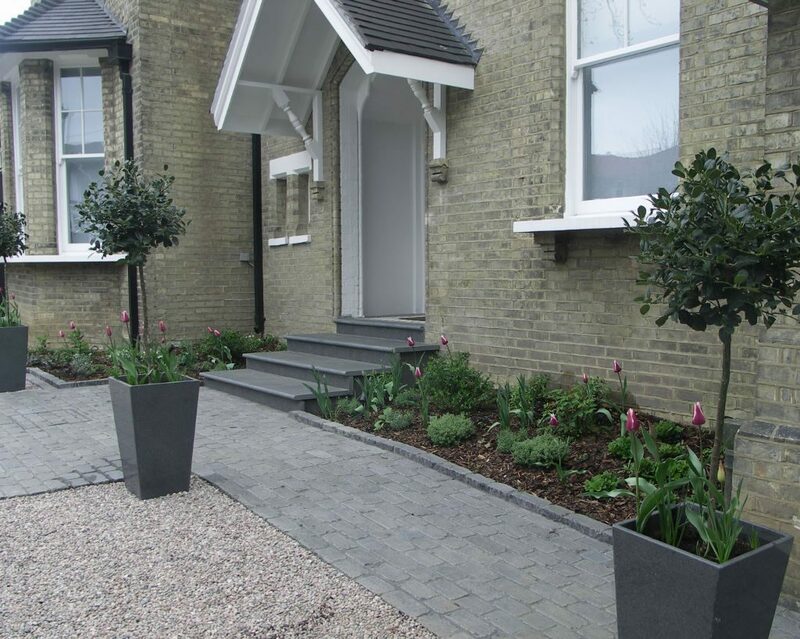 The attractive paved surfaces include basalt setts, small pebbles, dark limestone and Victorian tiles. 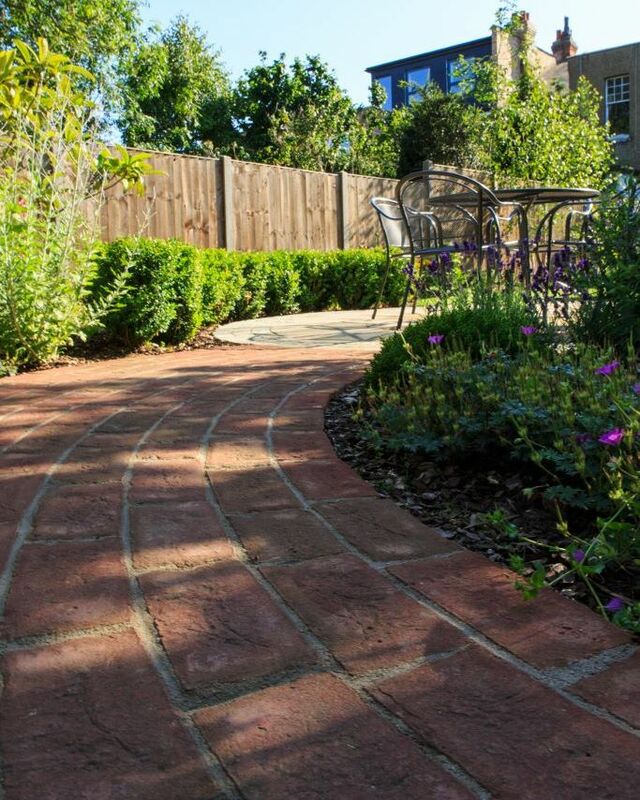 This long narrow garden in Stoke Newington feels spacious with its open boundaries and curving path of clay pavers from the patio and pergola. 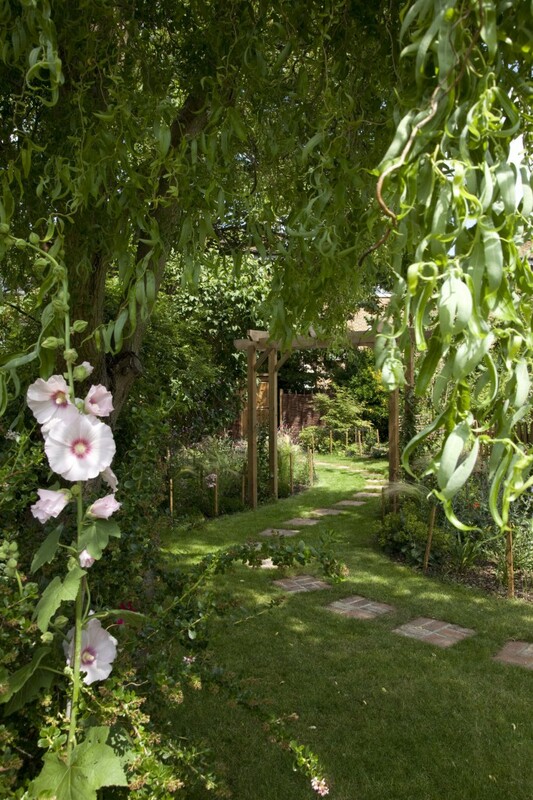 It winds past the willow tree and curved planted beds under the arch to a work area screened with willow hurdles. 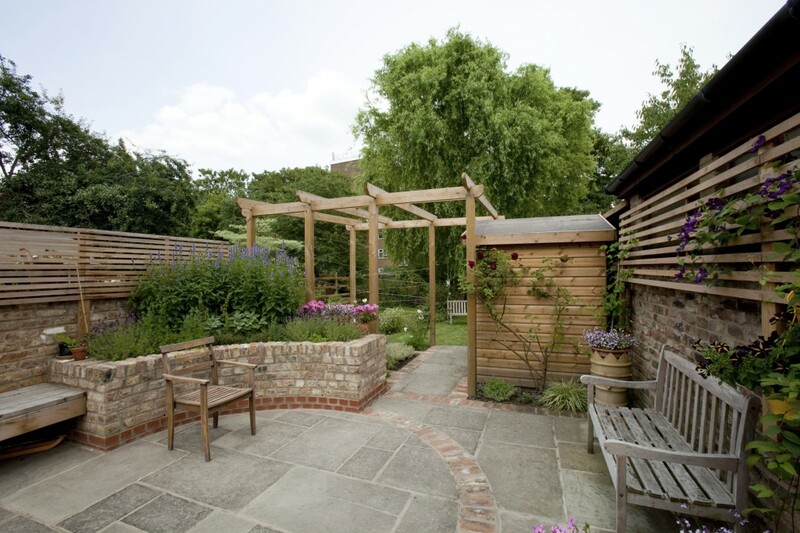 Clay pavers add interest to the cedar-screened patio with a cedar bench between reclaimed brick planters, beautifully planted with herbs including blue agastache which is much loved by bees. 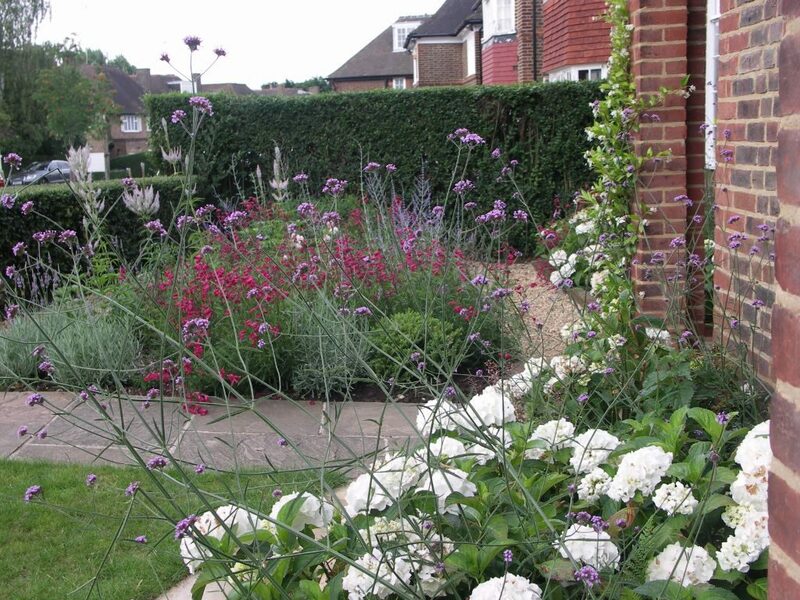 These gardens are all small to medium gardens in North London. 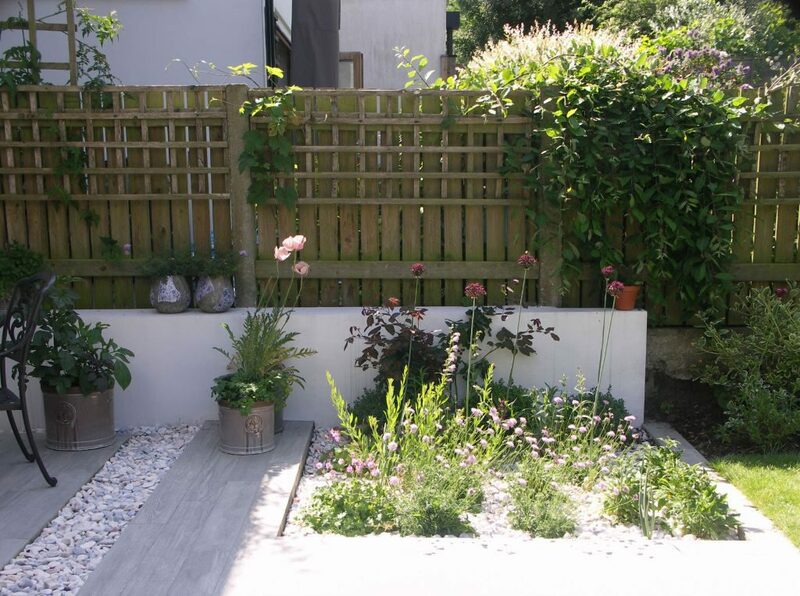 In Muswell Hill, porcelain plank paving and a raised planter with bench are elegant and practical. 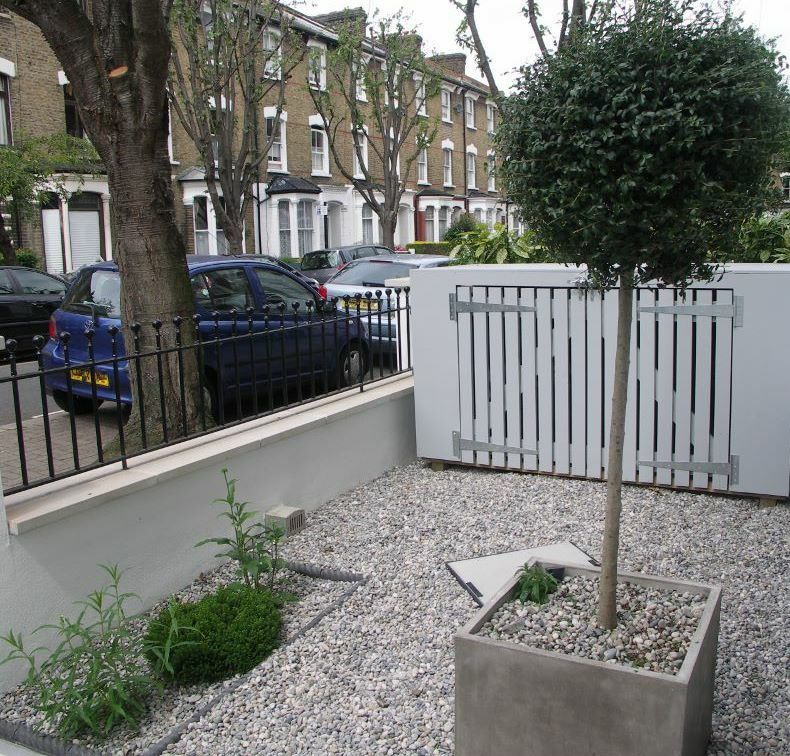 The low maintenance patio garden in Stroud Green uses light sandstone paving and planting in cube containers. 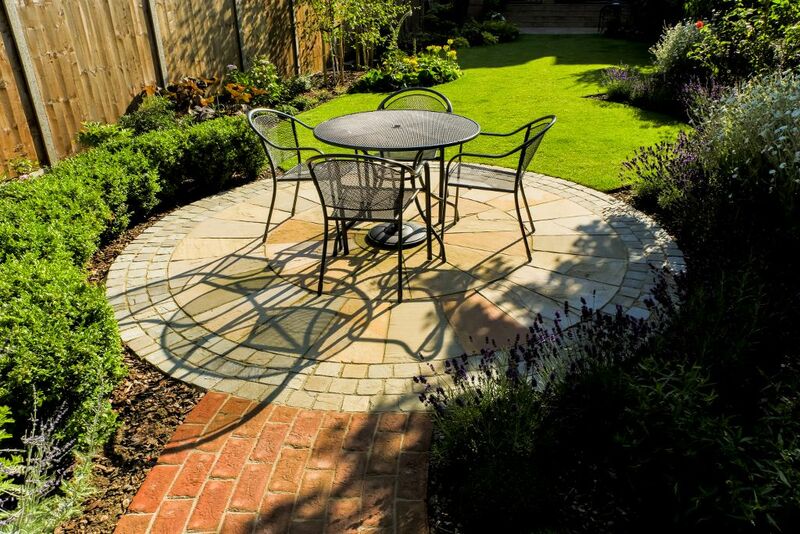 The longer lawned garden in Tottenham has curves to create deeper borders and lighting around the curved patio. 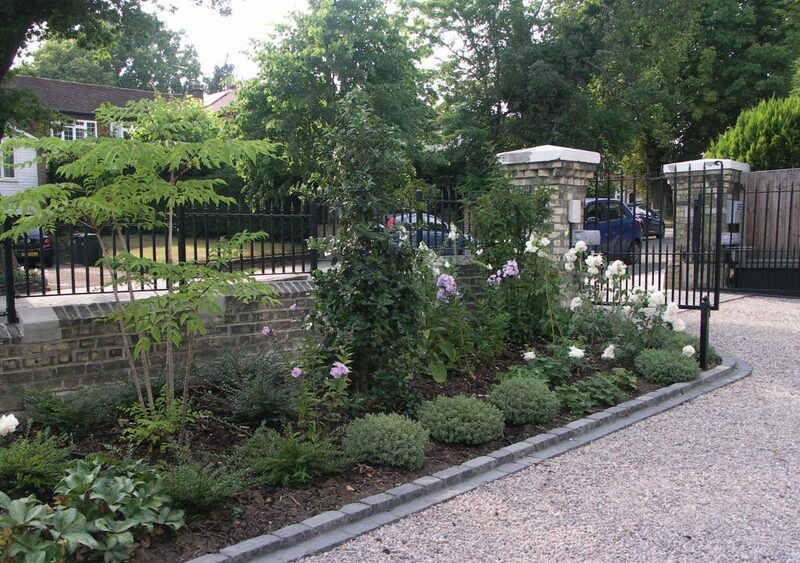 In East Finchley, a path of clay pavers provides a walk by grassy borders and around a millstone water feature. 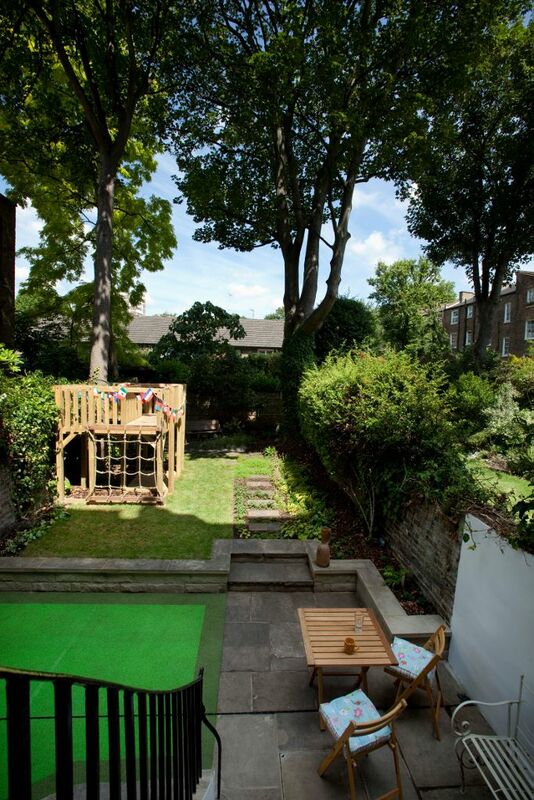 The hilly garden in Highgate was re-profiled to provide a view from the basement patio up to the magnificent sycamore. 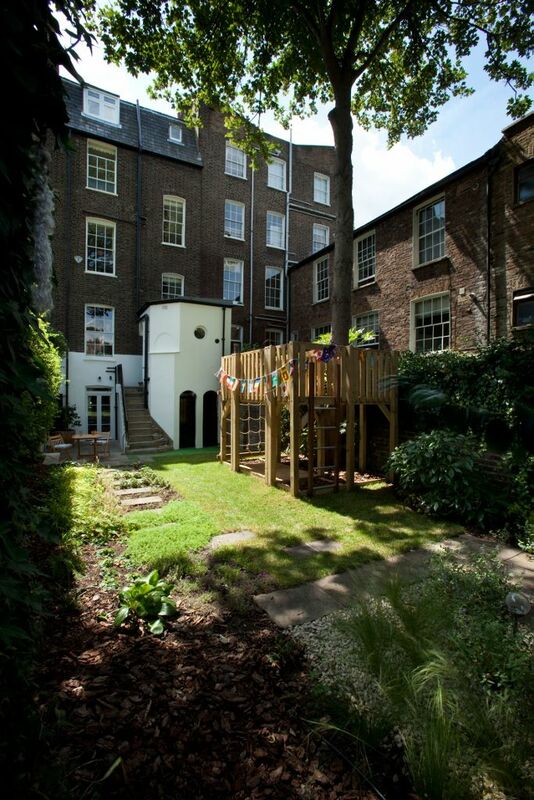 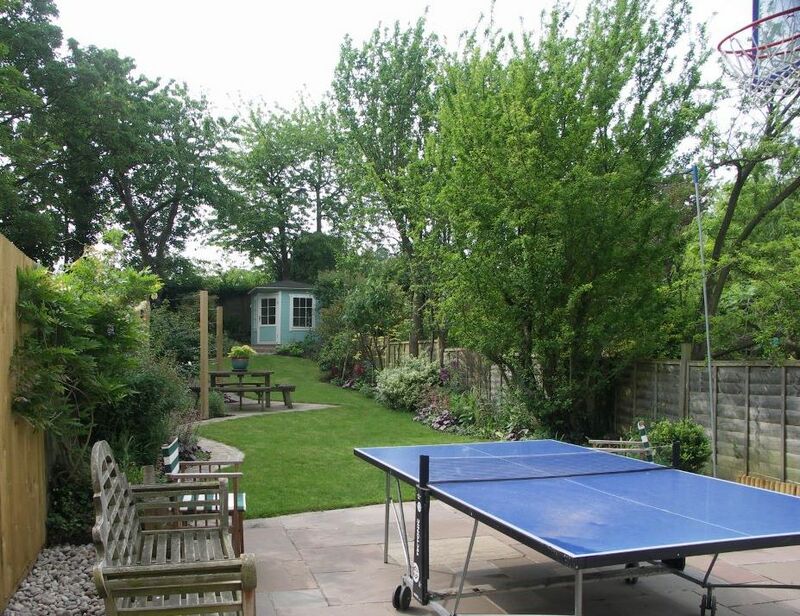 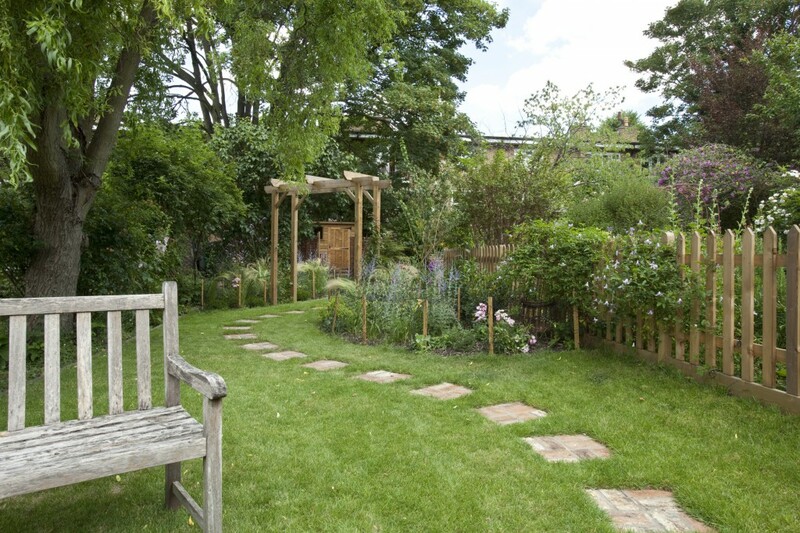 The long, narrow family garden in West Hampstead has different areas to relax and play. 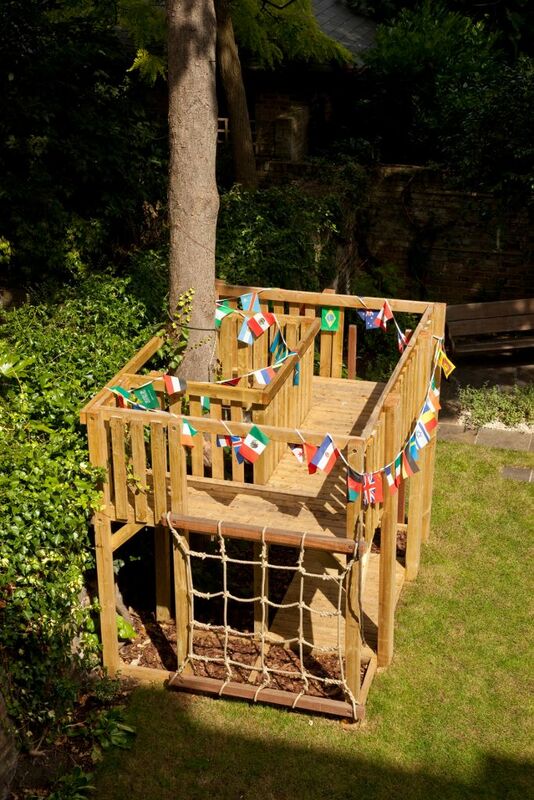 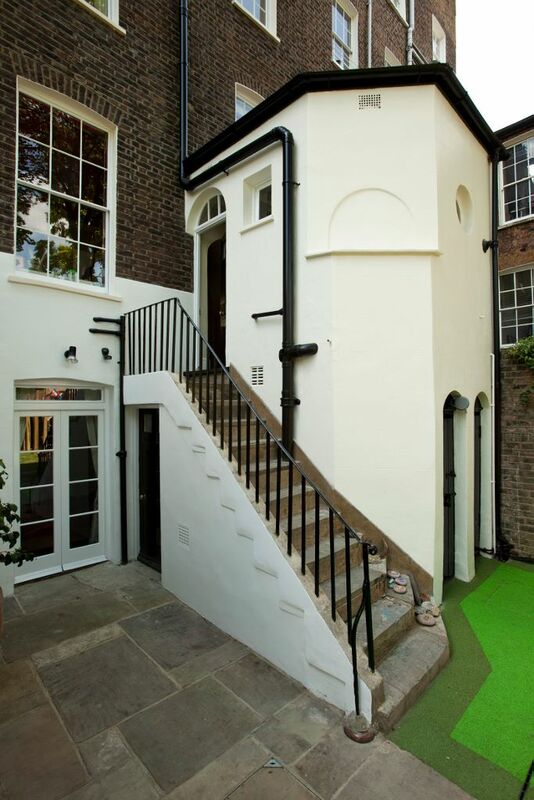 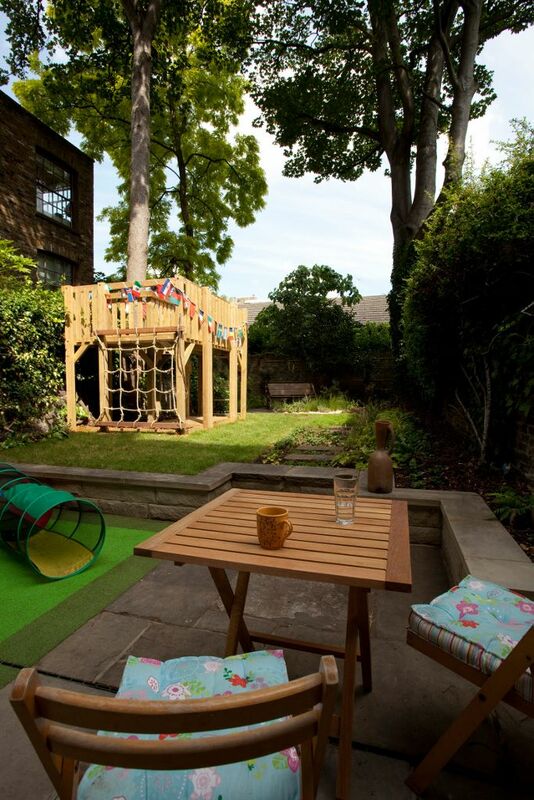 A bespoke adventure tower and re-cycled rubber play surface provide great play value in this walled garden in Islington. 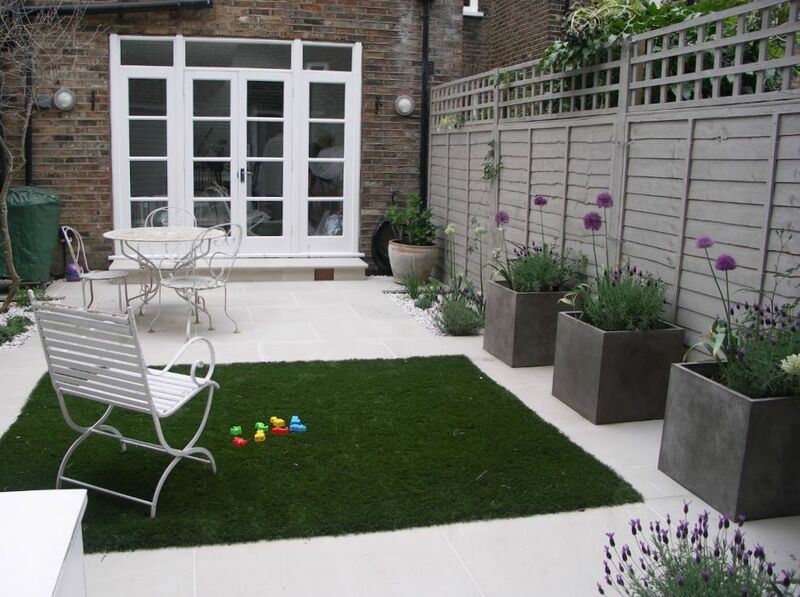 A new York stone retaining wall extends the patio and play area. 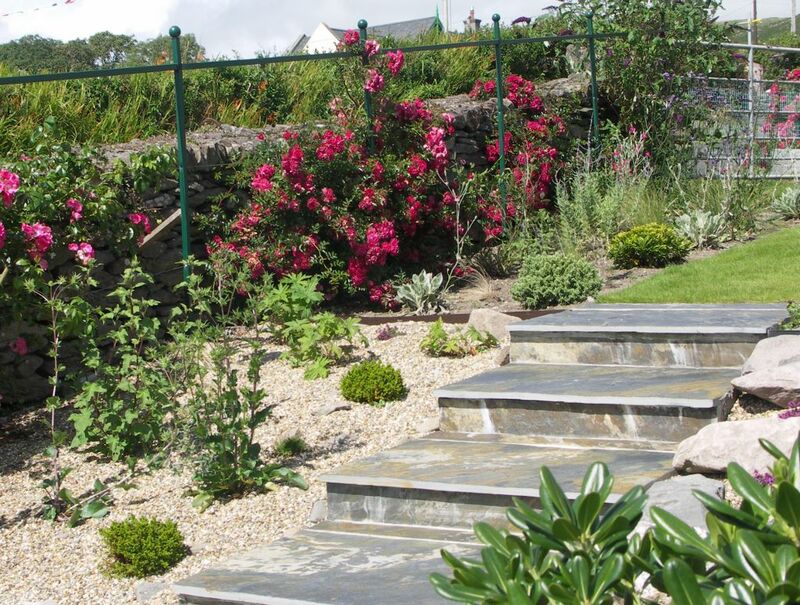 The original York stone patio is beautifully re-laid with good drainage and the staircase is made safe with extra rails. 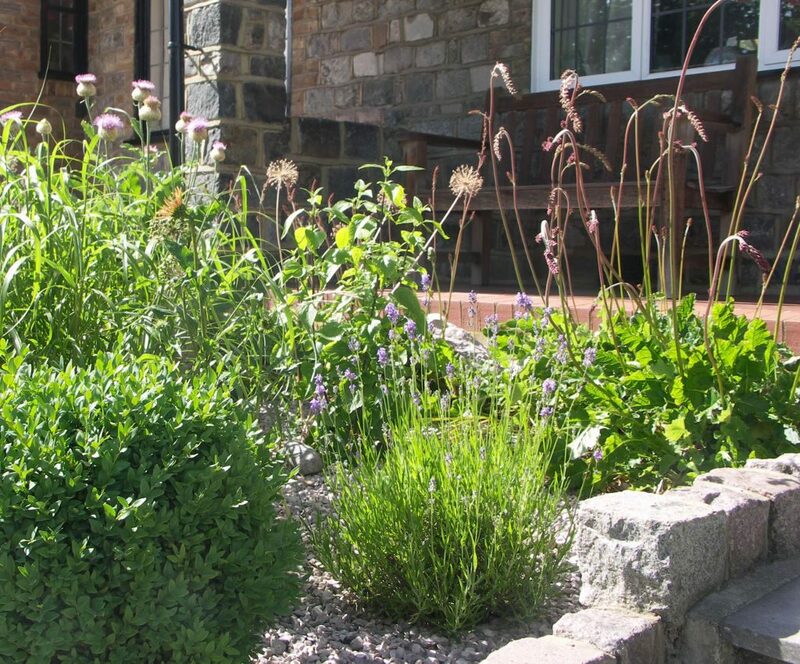 Stepping stones through a newly planted herb lawn including thyme and camomile lead to a sunny sitting space enclosed by the listed walls. 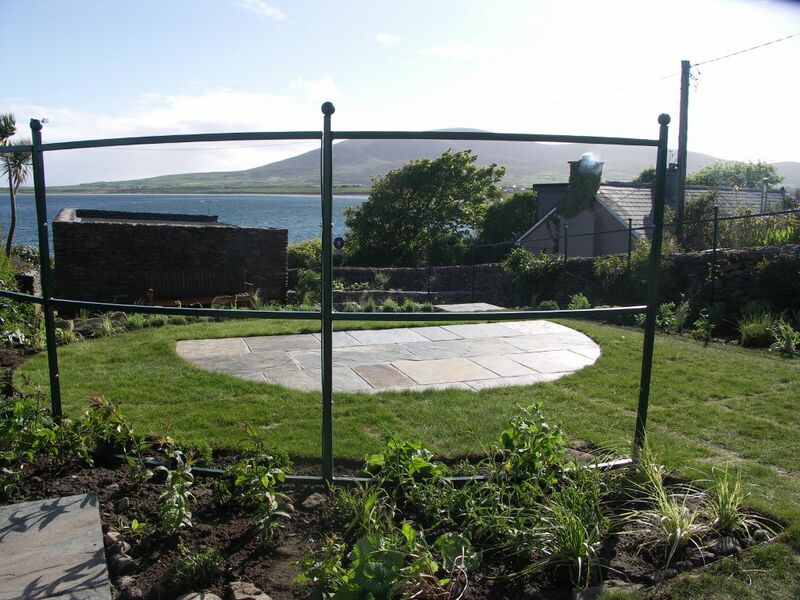 Green curved and straight metal screens frame this seaside cottage garden in Kerry, Ireland. 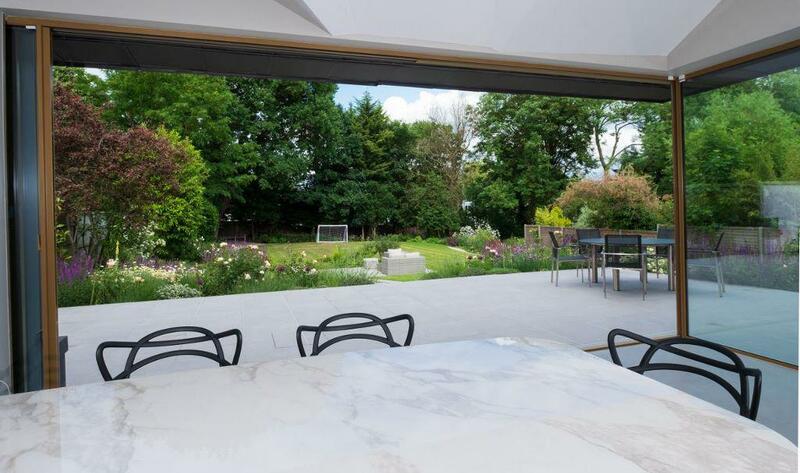 The screens surround a circular lawn and slate patio. 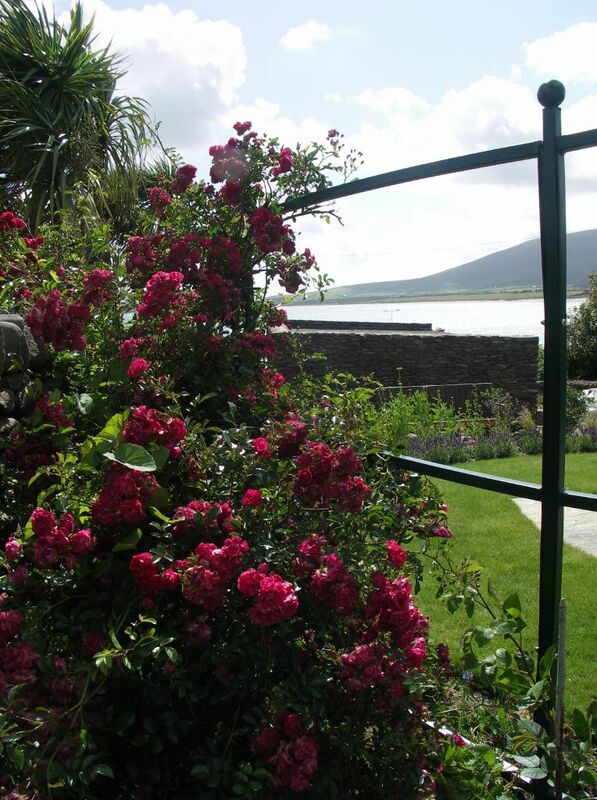 They focus the view towards beautiful Ventry Bay. 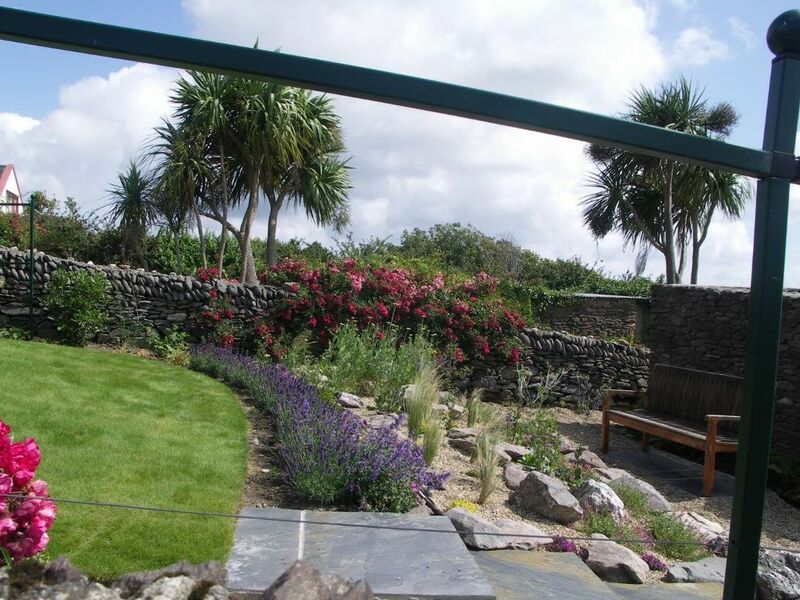 Slate steps come down through the rock and gravel garden to sitting areas in front of the stone walls of the garage and the curved raised bed. 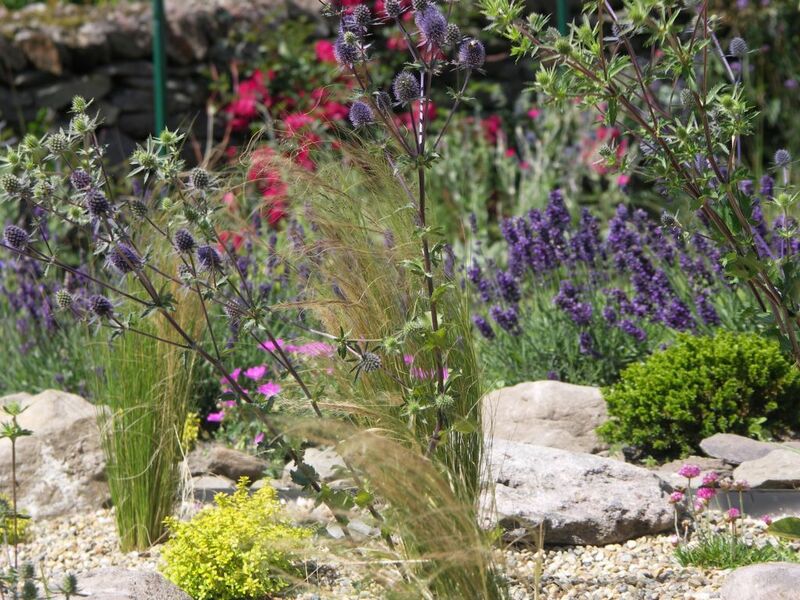 The sunny gravel garden displays blue sea holly, pink campion, thymes and grasses. 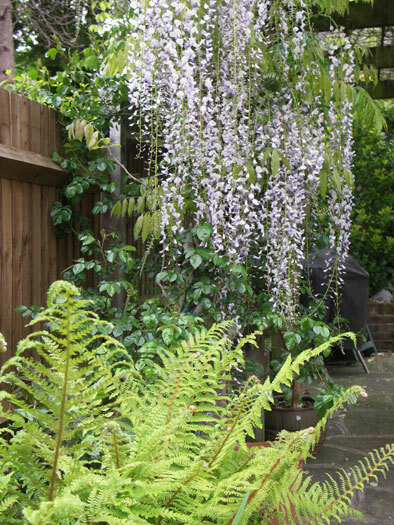 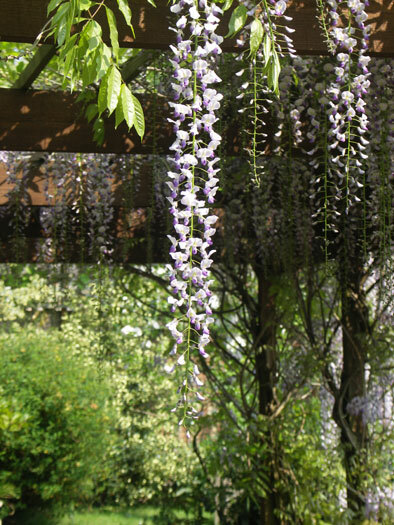 This north-facing garden in North London makes the most of the sunshine towards the back of the garden with a wisteria-clad pergola and dining area. 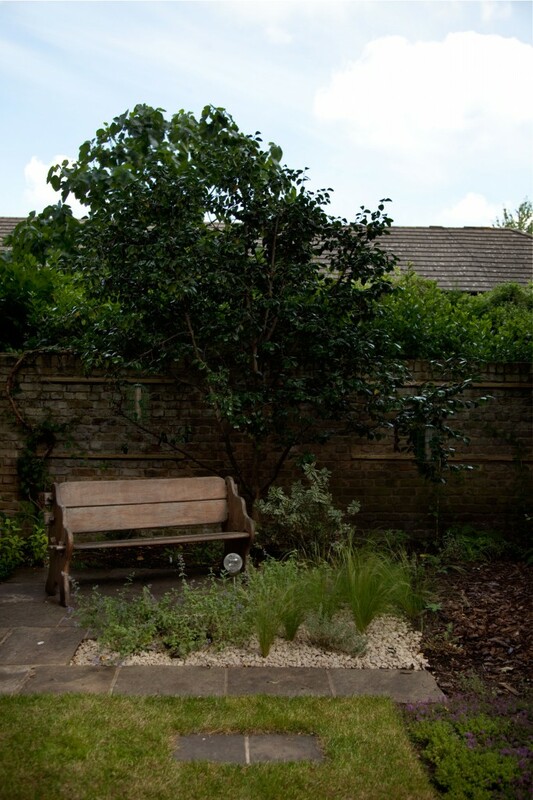 The west-facing sitting area is edged with box and magnolia. 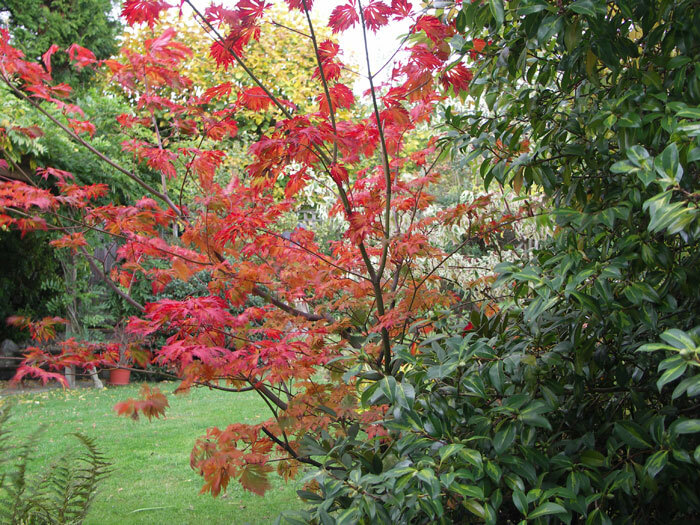 The planting close to the house includes ferns, euonymus, mahonia, acer, a splendid ‘wedding cake’ tree and rhododendron. 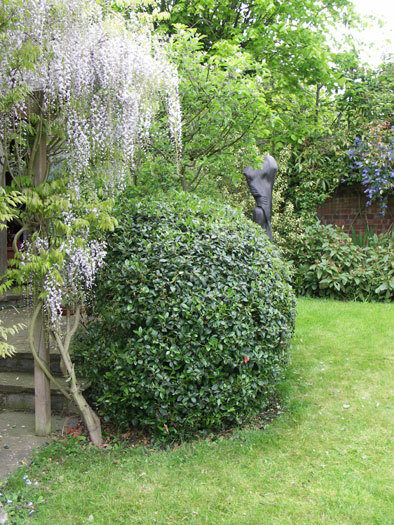 A sculpture of a young man set against holly bushes provides additional interest. 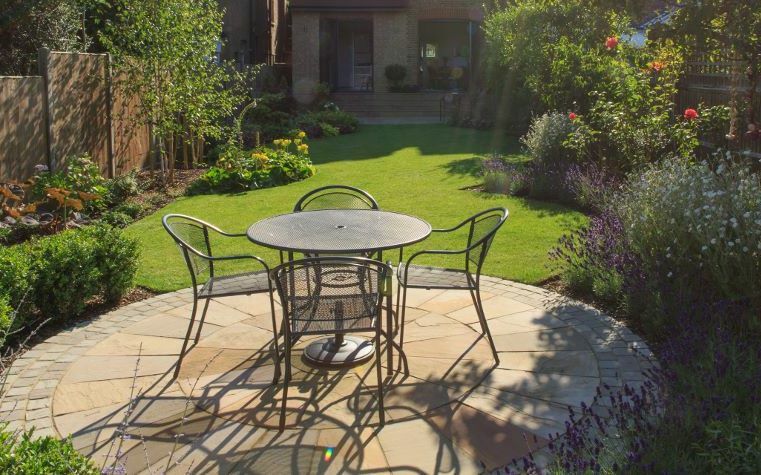 A curvaceous lawn in this Finchley garden, leads to a circular sandstone patio. 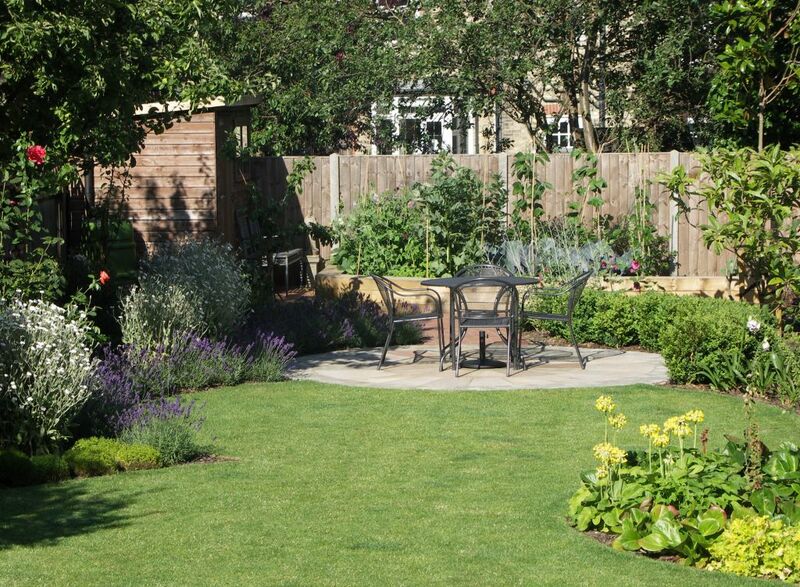 Lavender and box hedging encircle the sunny patio and a loquat tree adds to the Mediterranean feel. 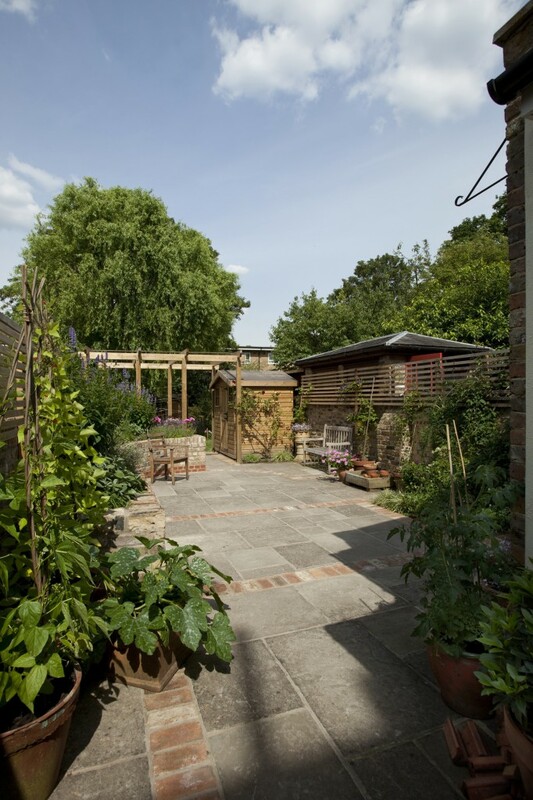 The curved brick path leads to the shed and the raised vegetable bed. 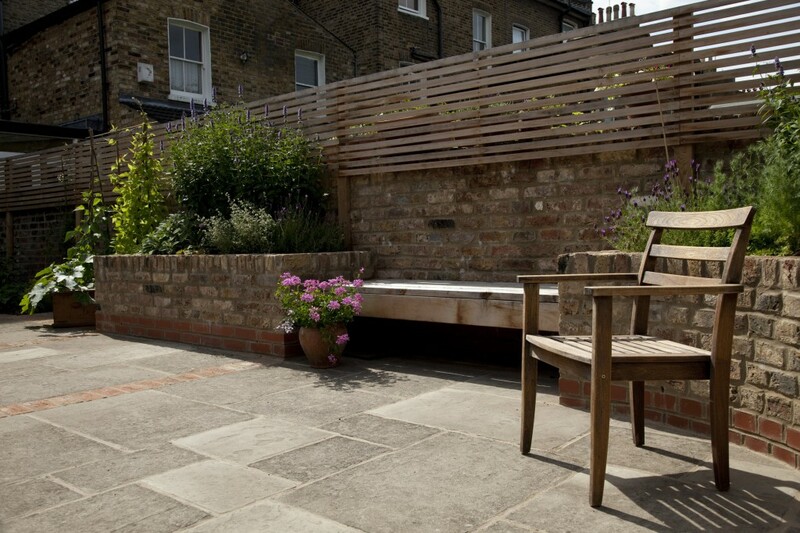 Sleepers edge it and provide informal seating . 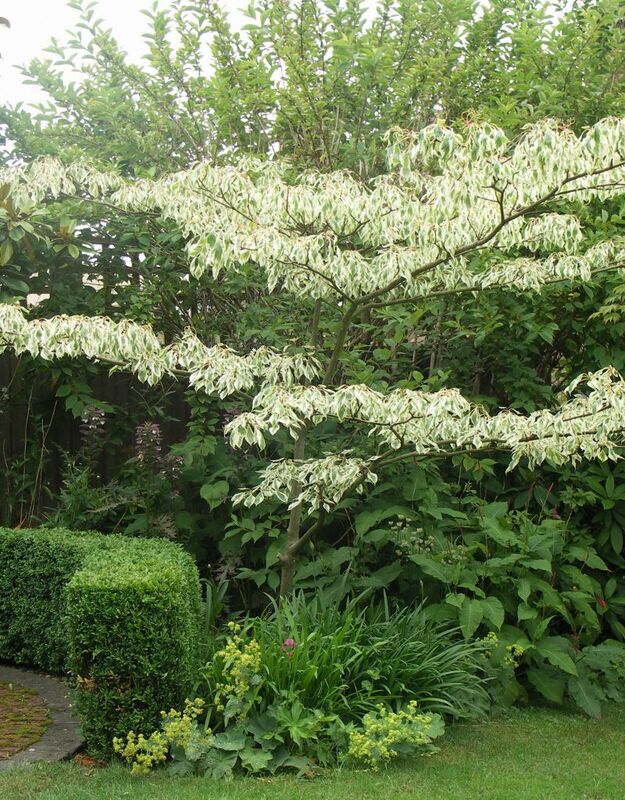 White birches, acers, cornus and a magnolia tree add height. 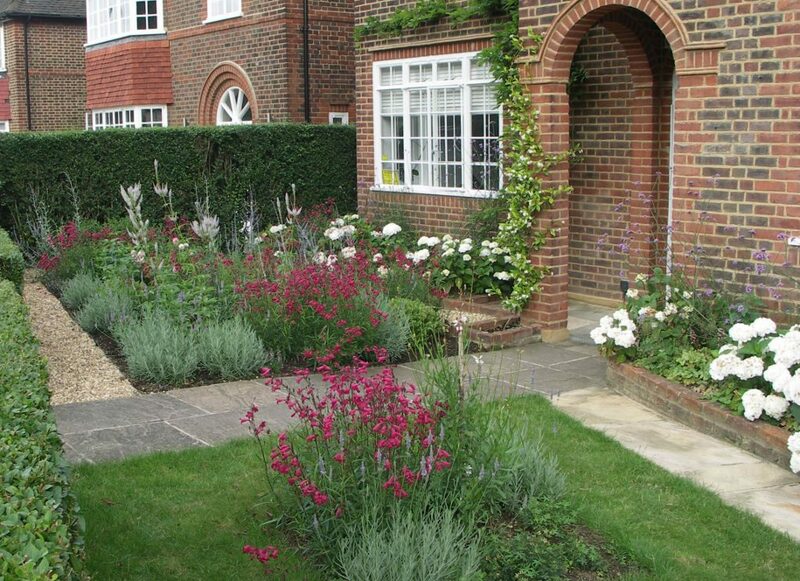 White flowers of veronica, japanese anemone, lychnis and hellebores give splashes of seasonal colour. 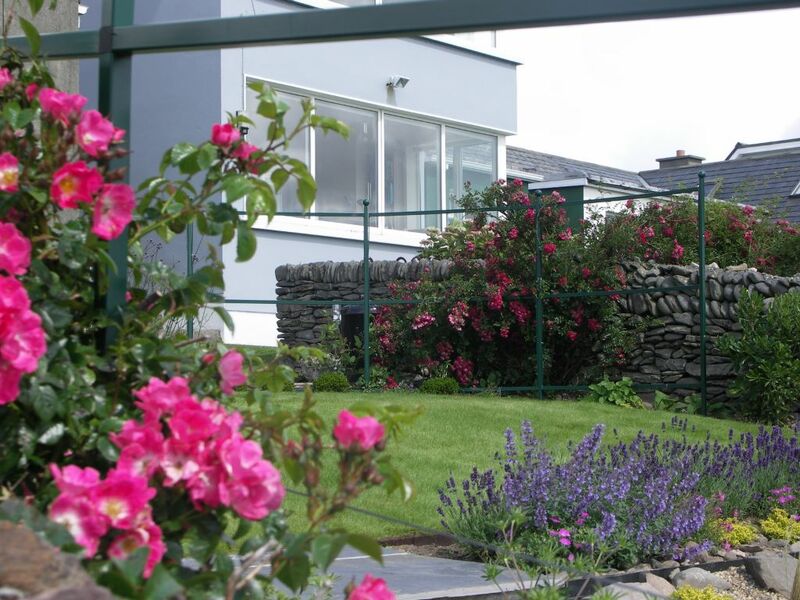 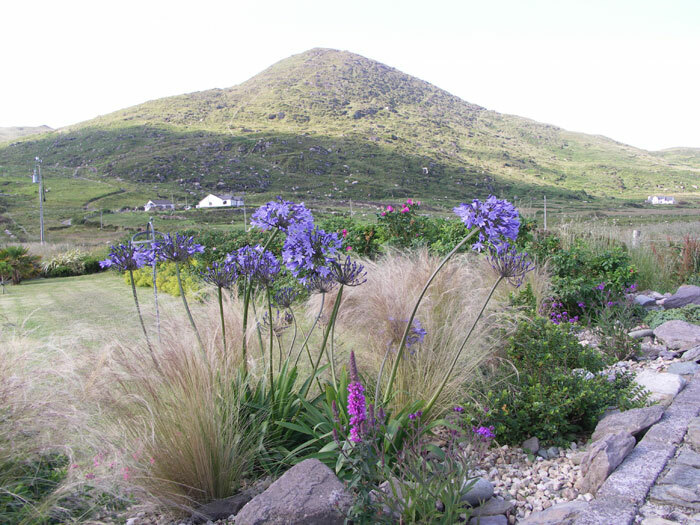 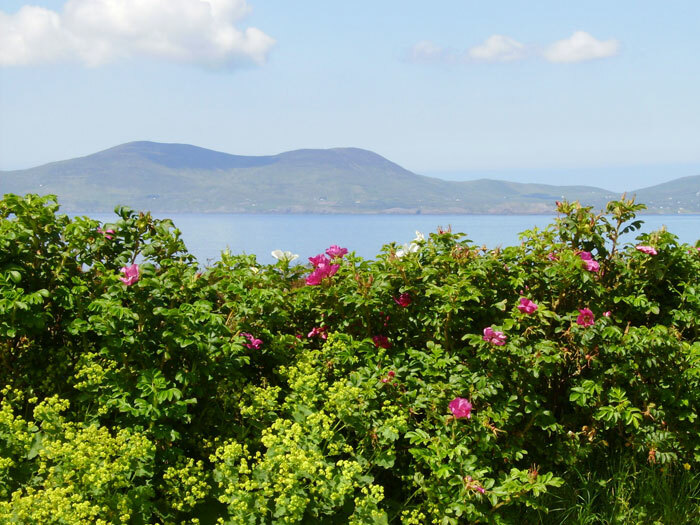 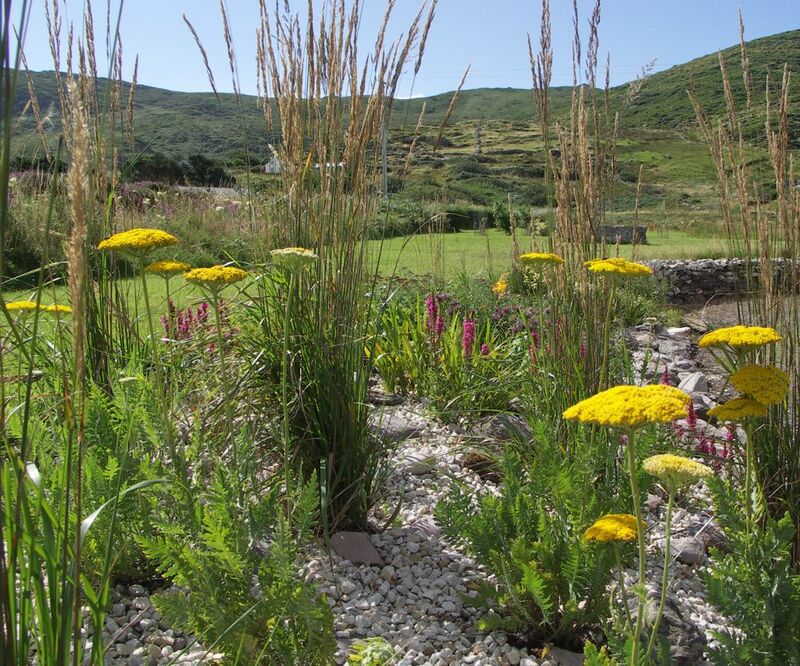 The garden is set in an area of outstanding natural beauty beside Ballinskelligs Bay in Kerry. 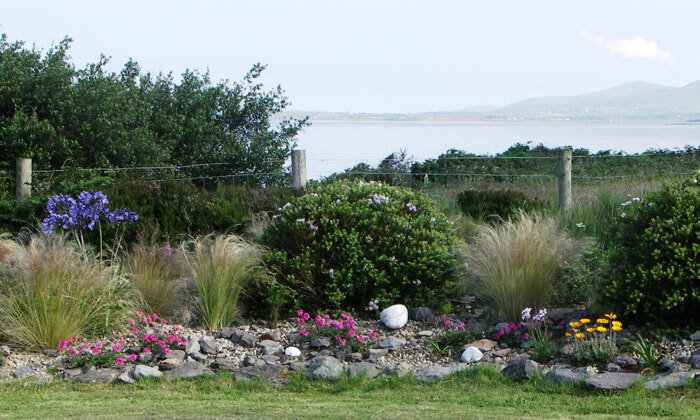 It is subject to salt-laden gales, heavy rain and occasional drought. 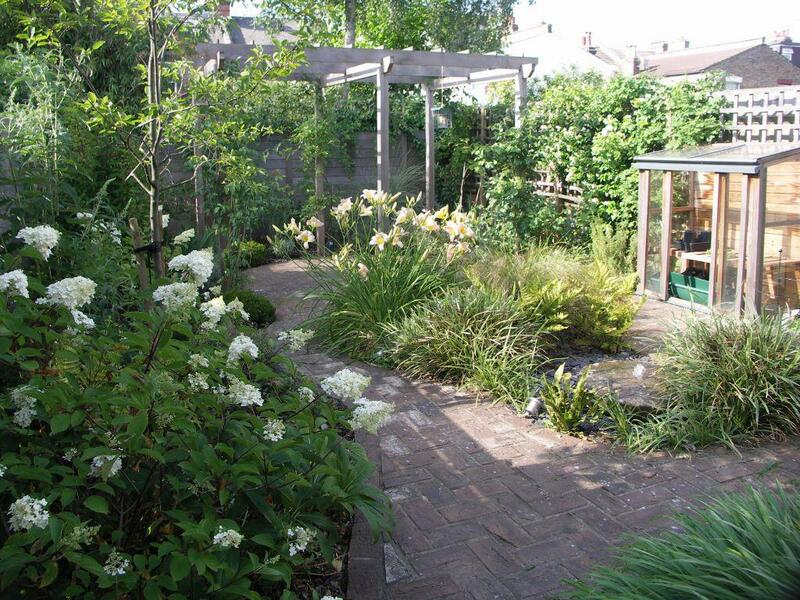 Shelter is provided with rose hedging, escallonia, phormium and mounds of different hebes. 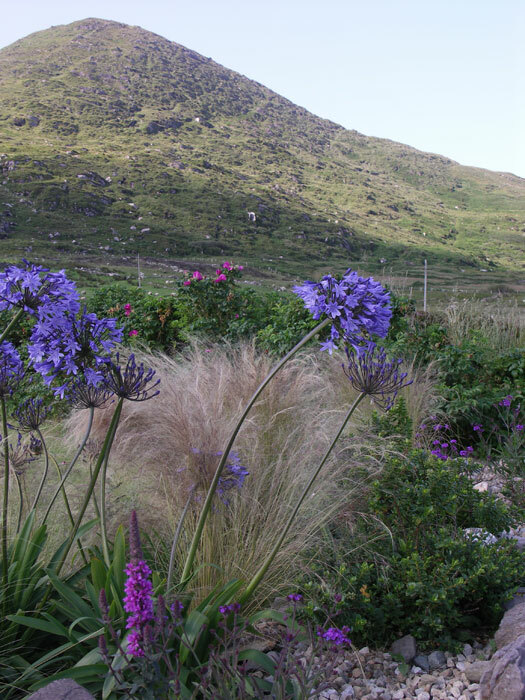 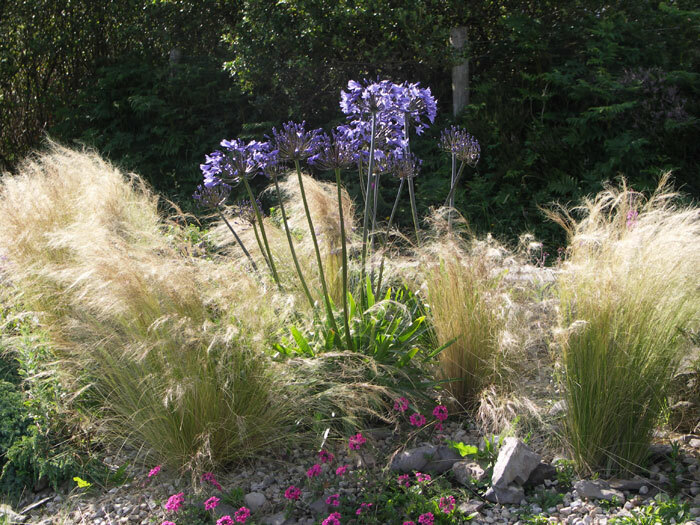 Grasses, day lilies, agapanthus and sea thrift thrive in the mild sea air. 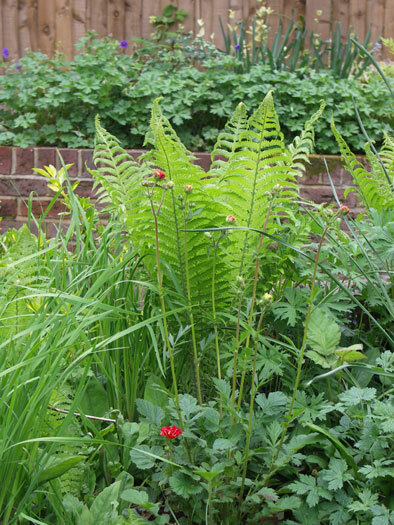 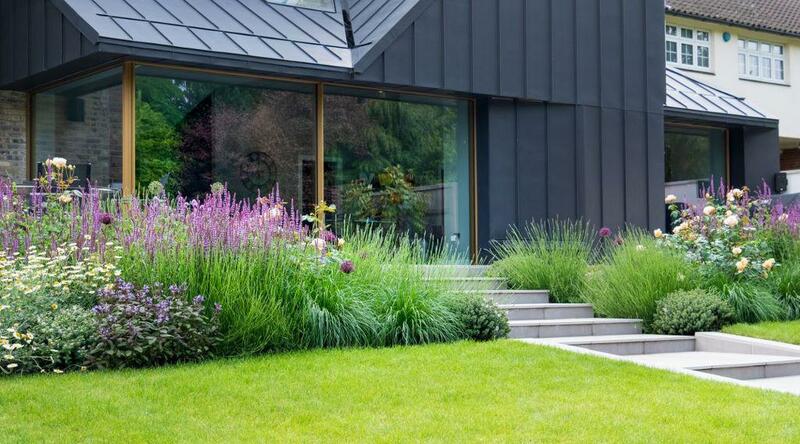 The long border echoes plants that seed naturally and includes euphorbia, crocosmia, loosestrife and achillea, set-off by the golden Karl Foerster grass.